Sometimes it seems as if there is not a week in the year when our lessons are not interrupted by student travel. This is particularly tricky in courses packed with required content, especially when physical presence is imperative as is often the case in lab courses. Or is it? Fortunately, technology has made this issue relatively easy to resolve as long as you are willing to flip your teaching and assume the role of facilitator in your classroom as opposed to a more traditional approach. Today in our faculty meeting we discussed ways to ensure that meaningful learning is going on during these periods of time for all students whether they are in the classroom or not. For science teachers, one key component to flip teaching is to ensure that the hands-on, visual aspects of instruction are incorporated in the learning. Over the past few years, I have collected activities, simulations, games, and virtual labs that can be used as substitutes for certain laboratory activities so that the students can participate in the learning along with the class from remote locations (provided they have access to the Internet). 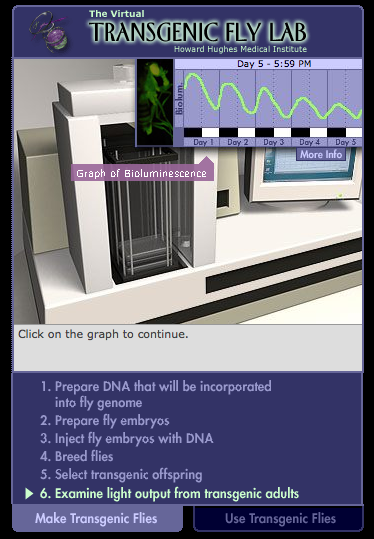 The Howard Hughes Medical Institute has created a set of great virtual labs that would be suitable for advanced biology high school courses (AP or IB) or first year university courses. I particularly like the transgenic fly lab, as we all know how messy those fruit flies can be! I have compiled a selection of links to science simulations and games for chemistry, physics, and biology on this collaborative doc if you find something great to share, please add it to the doc! My only request is that you keep to the format of the doc so that others can easily search for activities and labs that fit their curricular units.